Why a custom fit cover? Universal and semi-custom covers had been around quite a while before Covercraft identified the market potential, and began catering to enthusiasts who wanted a more "perfect fit" for the cover being used to protect their pride and joy. 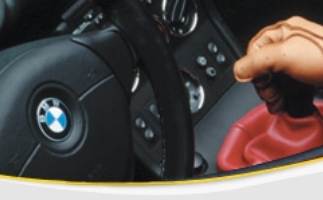 Back in the 60's (in the last millennium), the most popular covers we made were for British and European sports cars and they were called "mittens". Today, custom covers are made for everything from kit cars to motorhomes, and we process orders for custom, made-to-dimension patterns every day. Originally started in Germany, where Porsche covered the front of each car as it came off the production line prior to a shake-down run around their famous test track, masks have long been considered a necessity for any car owner wanting to protect the area of the car that takes the most abuse on the road - the front end, especially the leading edge of the hood and any painted areas around the grille. We all know what the summer sun means for you and your vehicle - damaged leather interiors and unbearable heat. If you own a car, truck or van and live in a place that has at least 1 sunny day a year, you NEED the Eclipse Sunshade. The Eclipse Sunshade has been manufactured for nearly 20 years and is the original retractable and self-storing car, truck and auto windshield shade. 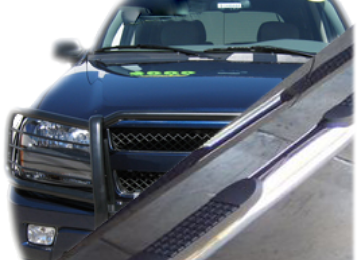 With a unique approach to tubular steel manufacturing and customer service, Steelcraft continues to produce Grill Guards, Bull Bars, Side Steps, and other accessories months before the competition. Simply put, when a brand new vehicle hits the road STEELCRAFT WILL HAVE IT FIRST and when Steelcraft has it first, YOU HAVE IT FIRST. The right soap and polish is extremely important in maintaining your vehicles paint job, and keeping its luster. With Wizard's wax and car wash soap, you will always know that you are using the right product. The proof is in the shine!